Section 9 Hood River to Ellensburg WA. 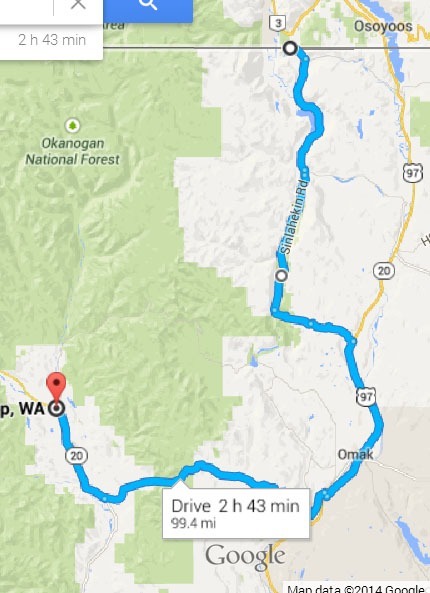 Our last section is the shortest section of the entire trip, leaving Winthrop traveling along high 20 as is follows the Methow River for a few miles until we say goodbye to it and we head north east and soon turn northward as we join US 97 heading north. This is the last of the major highways that we will travel on as we pass through the last two towns of our journey, Okanogan and Omak, in 10 miles we take a left on Pine Creek Road, a small two lane that makes a perfect ending to our journey, it turns into Sinlahekin road, passes by Blue Lake and at the small hamlet of Lumis we take Lumis-Oroville highway and in 14 miles, as we pass Palmer lake, we take a left on Sinlahekin road again, and in just over 3 miles we're at the Canadian border. Our journey has ended.